← Siân’s & Telly’s Friday Night Fiesta! The paperback’s here!!! OK – I know I’m crap at marketing, but I’m great at re-cycling! 😉 See this as ‘another chance to see’ the recent blog tour that launched the eBook, only in it’s spiritual home (well at least where it was written, since it’s permanently on display on the actual book blog). The printed edition is now well and truly out there, sailing down that big ole river and out onto the oceans of literary consciousness, so let’s mooch around in style for several days worth of freebooting-related postings, while Telly and I put our feet up and splice the pina colada mainbrace. Maybe indulge in some rum and raisin ice cream as well… Who’re we kidding! We’ve got Ben & Jerry’s on speed dial and plentiful supplies of choccy wafers, maraschino cherries, and little paper umbrellas. Even if you’re not a fantasy or sci-fi geek, most people will at least be familiar with the concept of massively multiplayer online role-playing games (MMORPGs) and the curious attraction of playing in imaginary, often horribly realistic, scenario-based video ‘worlds’ such as The Sims, Tomb Raider, Half-life, Minecraft or the godfather of MMORPGs, The World of Warcraft. No? Have ever watched the Big Bang Theory? Joined the Trekkies, or a fan community where you can ‘become’ a Klingon, a Jedi, or a hobbit. Took the part of a ninja warrior, or a barbarian for a live-action roleplay game perhaps (LARP)? Or, going further back into the mists of time, indulged in some table-top war-gaming with the grand-daddy of them all, Dungeons and Dragons (D&D)? Purists will argue that you can trace the history of roleplay games even further back, but we’ll stop at D&D, way back in 1974, because that was the point at which people really began to embrace pen and paper roleplay games. I came late to it in 2005, when I had fallen seriously ill in all kinds of ways, that had culminated in a massive breakdown, battling chronic depression, and started out on the road to early retirement. In need of some intellectual and creative stimulation, I drifted onto an online Tolkien fan community that had started up in 2000, when the Peter Jackson films had burst onto the scene. There, you could chat to other aficionados of the books and/or films, write fan fiction, make fan art, and play at living ‘in character’ in various ‘kingdoms’. For me the roleplay was something I shied right away from at first, because that was totally scary – at that point I had very little sense of self left and had trouble just being ‘me’, let alone something exotic, like an ent or an orc. Instead I concentrated on drawing and doing photo-manipulation graphics, but gradually I wanted to write some fan-fiction, and that’s how I began to think more seriously about creating my own Middle Earth character to explore a fantasy world I’d loved since I was ten years old. The way it worked on the roleplay forums was that you couldn’t play any of the famous characters from the books, otherwise it would have been awash with Gandalfs, Frodos and Galadriels. Instead, people made their own characters up to play in the kingdoms around the site that matched some of the locations from The Hobbit or Lord of the Rings. After a lot of agonising and abortive attempts to ‘settle’ in Minas Tirith or Rohan (so city guards or horse cavalry), I decided to become an elf, and headed off to Rivendell, home of one of my favourite characters, Elrond Half-Elven. I joined two ‘guilds’, the Elven Art Association and The Bards Guild and ended up running both of them in a fairly short time. My favourite of the two was definitely the Bard’s Guild and that’s where I started to really hit my stride as a writer, and as a poet. So much so that my character, Janowyn, began to subtly merge with my writerly self, as her voice gained in resonance and affinity (see my bio below to understand just how much my inner elf has influenced my work and choice of pen name over the last dozen or so years!). The more venerable the world, such as Middle Earth, or the Star Trek milieu, the more susceptible they appear to being translated into happy hunting grounds for the fantasy freebooting community, simply because of the original world’s popularity and exposure to impressionable youngsters. Fan fiction, in the hearts of the perpetrators (and I freely admit I am one such) is seen more as an act of homage than predation, and has become increasingly accepted as a valid preoccupation and honourable appreciation of the oeuvre of literary giants. In some fantasy bastions, fan fiction is now an established and legitimate theatre of celebration, especially for those based on television and film manifestations, where there’s not necessarily a single perceived originator. I’m talking cult status series and movies here, such as Dr. Who, and Star Wars naturally, which have an array of writing talents who were ‘only’ fans to start out with, churning out endless variations and retellings of their original object of fascination’s story, on a sanctioned and even financially permitted basis. Then you have the less obvious groupies like Stephanie Meyer (Twilight series), Anne Rice (Interview with the Vampire et al) and Charlaine Harris (True Blood) in the night-sucking arena, who are seen as pioneers, rather than developers on a theme, by virtue of almost rehabilitating the sub-genre into comparatively contemporary settings and dubious levels of political correctness. Siân Glírdan is the fusion persona of the elven roleplay character, Janowyn (Jano), High Bard of the River Kingdom and her ‘real world’ creator, author, Jan Hawke. Glírdan is the elven word for ‘songsmith’, and Siân is a Welsh variant of Jan (in case you were wondering!). When it became obvious to Jan that Jano had a far better handle than she could ever have on writing in the fantasy genres, Siân was born, fully formed and raring to go. 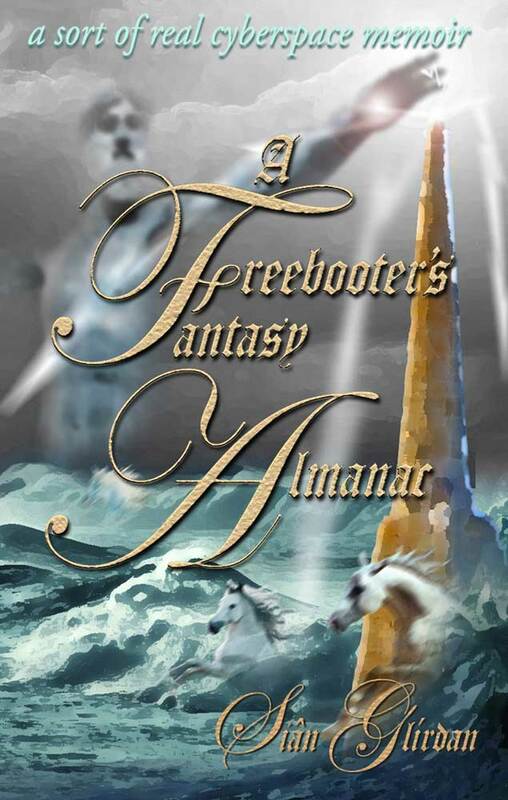 A Freebooter’s Fantasy Almanac, which is basically the manual on how Jano was brought into being and developed, is Siân and Jano’s first official collaboration. They’re currently working hard on an epic future fantasy series, Tomes of the Havenlands, loosely based on the ancient Celtic world. The first volume should reach the shelves at the end of 2016. This is poetry, wrapped in fantasy, within a memoir… Or, to put it another way, it’s a true tale that might well apply to many fantasy fans and gamers who can’t be bothered with keeping their realities separated from their more lurid imaginings. In my case, this is a sort of ‘real’ cyberspace profiling, during a phase of my life when roleplay truly did need to be therapy, because what was happening around me for real was not what I wanted to participate in. So, buckle up your swash and prepare to witness a titanic battle played out on the field of sanity – where what happens in your head is the only truth that matters. Posting on both your blogs. I don’t believe in coincidence and on that note, I must tell you that i got up from a sickbed last night for no reason I can surmise and wrote my review for ‘A Freebooter’s Fantasy,’ which I’d read when it first came out. I hope you like it and that it helps sell this unusual,, yet amazing book. It’s on both Amazon, Goodreads and facebook and will soon be on my blog and fb fan page. *rushing out to get my copy* Thanks, Jan. I have it. Can’t wait to start.